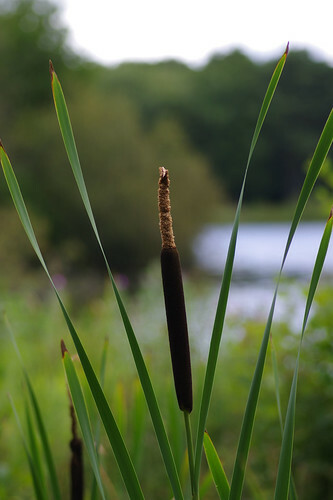 Bulrush (Common Reedmace) - (Typha latifolia) by Stover Lake. Four pairs of eyes are definitely better than two. Thanks to a couple of friends who agreed to be nature detectives for the day, our eyes and ears were opened to sights and sounds we probably would have missed. Initially, our route followed a section of the River Teign upstream, following its lazy flow around loops and bends, past peppered holes in the upper rows of sandy banks where sand martins had made their home. Unlike us, the adults did not have the leisure to rest and were always out on the wing, snapping up some tasty insect morsel to feed to their young. There's something undeniably therapeutic about water in summer. I think it's the music more than anything - it lulls you into a lazy, hazy dreamworld with its slow flow and its symphony of soft sounds. And when I'm not drifting in a strange yet familiar daydream, there is, of course, nature in all its infinite splendours to explore. Purple loosestrife is out in force by the river and further on, alongside the brook and Stover Lake itself. But before all that, we bid the Teign adieu, walk a length of quiet road and enter a wood where a soft carpet of pine and fir needles makes everything sound hollow. Across knobbly roots, under twisted forelimbs; past small pits of brackish water or others, drying or altogether empty. Out in the open, our old adversary, the wind, is playing havoc. 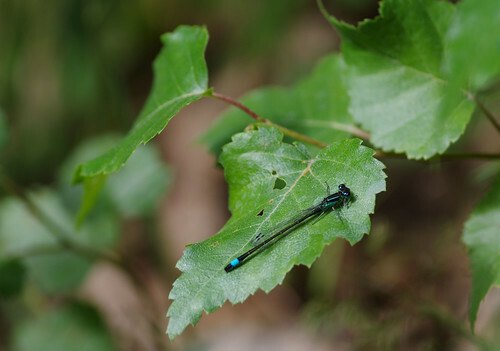 Perhaps it's my imagination but the breeze seems to ease when we walk, only to renew its blasts and gust maliciously when Sherry picks up the camera, trying to capture butterflies or damselflies as they come to rest. 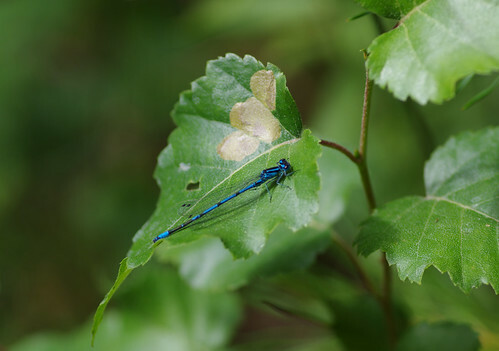 After comparing images on the computer at home and on other sites I am fairly confident that the first picture is an Azure Damselfly while the second matches the blue-tailed variety. Another two species accounted for and ticked off the list. I don't think we can break open the champagne just yet though! Even the simple pleasures of beans and mushrooms seem to taste better cooked on an outdoor stove. I don't know what it is about outdoor dining that always seems to increase my appetite. In spite of the rain and the bemused looks of umbrella-carrying passers-by, we persevered and thoroughly enjoyed our slightly soggy, outdoor feast. And the rucksacks were certainly a lot lighter once the rations had gone down! We walked round the lake and on the return journey took a different route, following a section of the Templer Way footpath that runs from near Haytor all the way to Teignmouth. Butterflies looked inclined to settle but the wind gusted its tricks and made focused photography a test of patience. 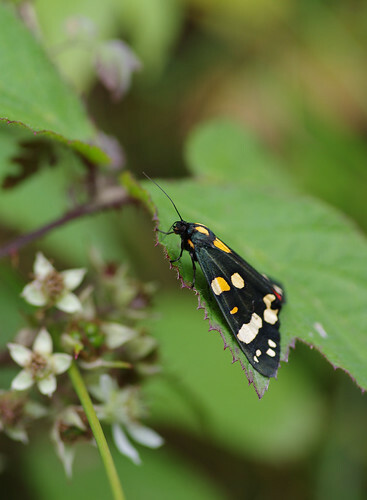 Sherry struggled to get clear pictures of a Gatekeeper butterfly during the intervals when it was not being blown about but had more success with a Scarlet Tiger Moth , before we continued alongside the disused Stover Canal, back towards our starting point.